I am one of many Australians who cannot commemorate Australia Day on 26 January because I find it impossible to celebrate national unity on a day that divides the nation between the Indigenous survivors of invasion and those who inherited the spoils of their dispossession. The antipathy of the Indigenous peoples of Australia to this day as a day of celebration is deeply entrenched. In the past, they have marked 26 January as an occasion to publicise their grievances against the dominant society. In 1938, Aboriginal people commemorated the sesquicentenary as a Day of Mourning and Protest organised by the Aborigines Progressive Association. In a manifesto entitled 'Aborigines Claim Citizenship Rights', they asserted that 150 years of so-called progress for non-Aboriginal Australians was for them a century and a half of misery and degradation. In 1972, Aboriginal land rights activists set up the Aboriginal Tent Embassy on the lawn of Parliament House in Canberra on Australia Day in response to the refusal of the McMahon Coalition Government to consider their demand for land rights. This was a highly original protest and the notion of 'embassy' implied the alien status of Indigenous peoples in their own land. In 2011, Australia is a far different nation to what it was then and Indigenous protest movements have played their part in building a better society. When I ponder on being Australian, I think of the natural beauty of Australia and the Indigenous peoples whose cultures adorn the island continent. We are a diverse people in a diverse land and these are aspects of our identity we can celebrate as a nation. I think too of the Mabo decision of High Court of Australia in 1992 that has led to major reform especially in recent times as state and federal governments have shown they are prepared to work with Indigenous peoples to resolve native title issues through mediation. Considering these important events, I believe we should choose a day other than the day the First Fleet landed at Port Jackson to celebrate Australia Day. I suggest Wattle Day, the first day of September is an ideal day for this purpose. The Australian floral emblem is acacia pyenantha — Golden Wattle. Wattle as a symbol offers something to Indigenous peoples because it is native to this place rather than being a memorial of our ties with Great Britain. 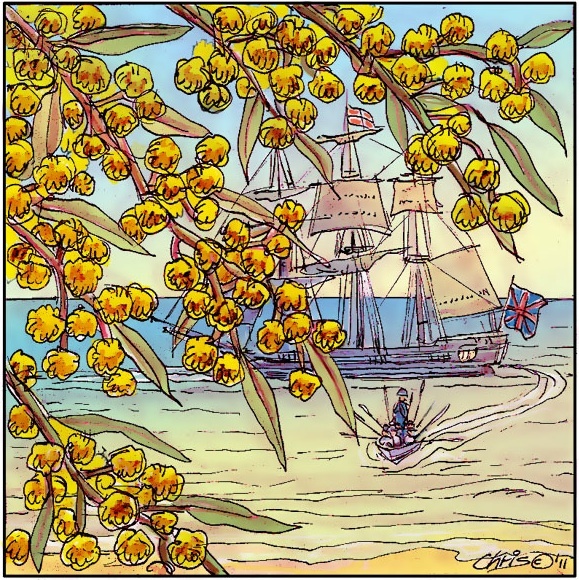 Henry Lawson wrote of wattle as a symbol of Australia and of being Australian. It is also a symbol of the nation's integration as part of the Asia region, and the first day of spring down under heralds new growth. In August 1999, Governor-General Sir William Deane stood by Switzerland's Saxeton River Gorge with the families and friends of Australians who died in a canyoning expedition, and threw 14 sprigs of wattle into the waters. He said the wattle signified that a small part of Switzerland had become and would always be part of Australia. This exemplifies wattle's power as a symbol of the nation — it is embedded in our history and culture. Lawson likened the power of wattle to that of the shamrock, thistle and rose of the British Isles. Wattle is a unifying symbol and in its multitude of forms, it grows in every state and territory. Its profusion is a sign of fertility for a growing nation. As a symbol of nature, it is a sign of the depth of feeling Indigenous people have for their land. Their ecological practice is an outcome of their relations of kinship with the natural world and they contribute a great deal to land management across Australia based on their eco-knowledge. There are a wide range of cooperative activities between Indigenous groups, government and industry. Indigenous people refer to these as 'looking after country'. Their co-management practices extend from World Heritage Areas like the Great Barrier Reef to parts of the country where they are the only presence. Living in harmony with the land is an Indigenous practice we can acknowledge on Australia Day. It is consistent with our need to conserve water and other natural assets. Recently, Prime Minister Gillard announced that the Federal Government would set up a panel to consult widely about an amendment to the Australian Constitution recognising Indigenous Australians as First Peoples. This is a step towards integrating Indigenous peoples fully into the Australian nation while recognising their essential difference. The consultation process provides a forum for gauging Indigenous peoples' feelings towards celebrating our national day on a date acceptable to all Australians. Paul W Newbury writes on Indigenous issues and the environment. In 2003, he was co-author with Bob Randall of Songman, the Story of an Aboriginal Elder of Uluru, published by ABC Books. "integration as part of the Asian region". We are not part of Asia and neither Asians nor Australians consider themselves Asian. We are Actually part of the Oceania region. Maybe some research won't go far astray next time. Another thing that Wattle Day has going for it is that it is a Spring festival with all its connotations about new life, rebirth, and so on. I am sure that you will welcome feedback from some of our Indigenous brothers and sisters to see what they feel about the idea. Seems a great idea to me who as I am of Caucasion stock and therefore a descendant of the original invaders. I wonder if other responders to your article would identify themselves in relation to their ethnic background? That's pycnantha, not pyenantha. Interestingly, it grows in profusion on the central goldfields of Victoria (where I live), but its name probably comes from the depth of colour of its profuse flowers. Australia Day has risen in stature only in the recent decades. The history of nations is the history of conquests and subjugated peoples. Wattle Day is a day that might be embraced by the nation. What date does Paul suggest? For me, Wattle Day is the highlight of winter; the gold in the mists of grey. Rebirth is near. I, too, have been uncomfortable with Australia Day ever since I learned of the 1938 protest. Your argument for Wattle Day, and the ensuring comments, are inspiring and convincing. White invaders made the First Fleet but "Only God can make a tree". What a great idea. I very much liked the suggestion of an Australia Day celebration that would unite the nation. I am Australian born, fourth generation, of Irish stock. Thanks Paul. We need a revision of the way we celebrate our national day. We are now in a changing time and hopefully the amendments to the Constitution will bring about a new depth whether we celebrate in January or the proposed Wattle Day or some other day of significance. In defence of January 26, it is the day that the two cultures came together, and to have a complete change to the way we recognise this could be very symbolic. After all Wattle Day may just give us the opportunity to scrape our history under the carpet once again. On Wednesday I will be celebrating Survival Day as a white person and I look forward to the day when this country will fully recognise the place of Aboriginal people in the life of this country and to come to terms with our shared history. Jan 26 has the potential to be the day for doing this. But we do need to have a conversation about it. I love the symbol of the wattle as a way of representing the country in so many different aspects. Not sure it's got enough heft in and of itself to do the work of grounding Australia's national day; but I find the idea of using the wattle as a way of bringing together disparate elements of the Australian peoples and history together an inspired one. Thanks for the article! Wattle Day sounds good, but there is another national day that would be better. 13 February is the anniversary of the day the national parliament, led by the Prime Minister, said "Sorry" and many wounds began to heal. It is close in the calendar to 26 January, so would work as a public holiday. Another day, which could replace the old Queens Birthday is 27 May, the anniversary of the bridge walks. Yes. Don't just think of golden wattle. There are many species of Acacia. Just to mention one, I think mulga (Acacia aneura) would be the most common tree in Australia. A very apt and timely article. I struggle singing the first few lines of our national Anthem. We are NOT a nation young and free. This land is over 40- even 60,000 years old. A little over 230 years ago European ‘settlement’ first brought prisoners to this great south land. Our forebears took up Indigenous lands. Today little has changed and Indigenous Australians are overrepresented in our prison system and dying young. Such irony!. In 2008 the national apology to the stolen generations was meaningful. Our nation turned a page. However, last year we saw racist- based policies enshrined in the law of our land, again! This nation is more than 230 years young. Patrick Dodson is calling us to discover our national identity. Australia remains imprisoned due to her failure to truly engage with, respect, embrace and be open to her first peoples and their cultures. I've been feeling uncomfortable about 26 January for some time and for the same reasons. I had thought that Australia Day should celebrate the Federation, but Wattle Day is more inclusive of indigenous Australians. What about a public campaign, eg through Get Up? Your article has stirred me on to stand up and be counted at our Mass or perhaps before with a few suggestions on Australia Day. I feel very uncomfortable when certain lines in the song Advance Australia Fair comes up. It is about how we share 'our' land with those across the sea. We once did share 'our' land, as if it were ours to share,. but the way we allow refugees to sit in detention centres instead of processing them and welcoming then into our society is an absolute disgrace. Then we celebrate after Mass, on what a great country we have made, with little or no reference to the way we acquired this land. We acquire it through murder , because we thought the white race was superior. We soon prove we were not superior. I do feel for the aboriginal people who have suffered so much at our hands. And here we are celebrating. I value the suggestion of a different date, using the Wattle as the main emblem. I would like to make the suggestion that we ask the Aboriginal people how they think Australia Day might be celebrated. Great to see serious consideration of Wattle Day as a more suitable national day of unity and celebration. The Wattle Day Association certainly believes that much more can be made of wattle, our national floral emblem and symbol of national unity. Wattle is rich in symbolism and meaning. Let's have a national day that speaks of us and for us all. I still think of 26th January as Shame Day as well as Australia Day. My Great grandparents came as refugees from the Potato Famine of Ireland in 1856. We still have a very long way to go on both these issues. Even the land itself celebrates Wattle Day. Strange, most of the contributors do not feel comfortable or will not commemorate Australia Day on 26 January. I feel very comfortable and definitely together with my family we will commemorate Australia Day. Firstly, at dawn I will hoist (in our front lawn)our beautiful Australian National flag, a true Christian flag with the cross of St George, the cross of St Andrew, the cross of St Patrick and the Southern Cross.In the morning I will attend Mass and give thanks that I am in this country. A country of Parliamentary democracy, Rule of law, Freedom of speech and very generous and friendly people. Even though I was not born in this country, my late wife was Australian so are my children and we are all proud of Australia and loyal to our Christian monarchy, our Christian flag and together we will always take a stand to keep Australia Christian. "Wattle" Day, "Ground hog" day. I have no problem in recognising that before the British established this country as a colony of the empire, our native people were living in the stone age. Despite the harm we have done to them, we have also offered aborigines the opportunity for a better life. Long live January 26. What an excellent idea. I am a direct descendant of one of the first fleet convicts. The 26th of January recognizes not only the dispossession of Australia's rightful and ancient indigenous guardians, but also almost legitimises a vicious brutal penal system. Are we proud that people were transported to the end of the earth for petty crimes like stealing a coat? A campaign to move the public holiday to Wattle Day could be a great force for national renewal. I have just read your article, and I must say it has been very timely. As I have been pondering how to challenge all of us in our church to stop singing Advance Australia Fair, where we say something like we welcome all those across the seas. I feel most uncomfortable. And then we have a good old aussie breakfast to celebrate ''our''country. When will our church start thinking more deeply instead of doing 'what we always do'? Your article did the trick. I often wonder does Catholic mean Christian? To celebrate 'Australia Day' on Wattle Day with all its symbolism seems to me to be eminently appropriate. Each year we comment that the wattle bursts cheerfully into bloom in August, so a date in that month may be considered. The public holiday would need to be gazetted for this occasion so that all sections of our nation may celebrate together. Great to see the supportive comments, sad, those that do not understand. Those who wish to celebrate the arrival of Captain Cook on 26 Jan may, of course, still do so. I look forward to a concerted campaign to effect a rescheduling of our National Day. I understand that every day of the year somewhere around Australia a wattle is in flower. On this eve of 'Australia Day' the issue of becoming a republic has re-emerged (did it ever go away?). While we look to a past dominated by a connection to Great Britain and the Roayal family it will be difficult to change our idea of how we best celebrate our identity as Australians. Your essay gives a chance for us to consider a needed alternative as we move towards a more serious concern for a truly national identity and culture. To embrace this country we must look to our Aboriginal forebears to learn how best we can live here and become truly Australian. Thank you for your insight. Vive! (we are a multicultural people) a Republic and Vive! Wattle Day! To Ron Cini, I understand why you want to commemorate the things about this Nation that you hold so dear, but why is doing that on 26 January so important. What is the special significance of that particular date for you? National symbols are fundamental to national identity. What does the 26th of January symbolise to the first Australians? What does this say about our nation that we celebrate on this day? Let’s set aside the 26th as a date to pay our respects for those who have been wronged. We must find another day to rejoice! Thanks for a splendid idea, Paul. Let's now move forward to the 1st of September for subsequent celebrations of Australia Day. I love the idea! Plus, there's a serious lack of public holidays around August September. Brilliant. I agree though, that changing the day could open up an opportunity to gloss over the truth of invasion and dispossession. Perhaps we could go on commemorating 'Invasion/Survival Day' on the 26th, while we celebrate all together in September! I have often thought what would be a good day to shift Australia Day to. I like the suggestion of Wattle Day - September. 1st. GDAY,There are pushing 7 billion people in the world,there are approx. 22million aussies,ie: 6,978,000,000 people are not as lucky as we oi sayer's.Wattle Day is,the yanks would call it "Thanksgiving Day",a precious day for us to celebrate all 'our' heritages,all 'our' cultures,all of 'our environments. I've been running Wattle Day celebrations in my community 4 the last 5yrs,I hope to raise awareness about our local native flora and to raise money for Red Cross.I urge everyone to think of Wattle Day as significant day in its own right,not something to swap around with other nationally celebrated days.Yes, Wattle Day is inclusive, whether your an Greek Australian,an Irish Australian etc,a new Australian,an Republican Australian,an Monachist Australian or a First Australian, Wattle Day celebrates YOU and all thats around you in Australia! Wattle was our first symbol.If you need assistance in putting on a Wattle Day in your comunity,do what I did,contact Terry Fewtrell and co. at Wattle Day Association,they are an invaluable resource. (go to www.nsw2880.com to see what we've been doing ) This yr is 101 yrs of Wattle Days,time to teach all Aussies about the day. We could call the lessons "Wattle Day 101" Heritage,Culture,Environment,democracy and home. As a city of Sydney resident I too felt the discomfort...I experience now the sight of the Union Jack as a symbol of racism and I am reluctant to attend Yabun as I feel this an event for Aboriginal and Torres Strait Islander people to claim the space and reconnect with famuly and friends. However, the early morning ceremony at Botanical Gardens stood apart as an experience of unity...an invitation by the Yuin people to share story and ceremony and also the witnessing of the mutual respect, love and joy between Aboriginal people and Governor Marie Bashir. A new day and a new symbol may be the balm that we all need, I love the suggestion of Wattle Day. Is 1 September 2011 a Public Holiday ?? Good article, Paul. I have designed a new flag for an independent and mature Australia which has the wattle as a central motif, also including the colours of the Aboriginal flag and the southern cross. All our own symbols. With the sporting world constantly using the colours of wattle when representing Australia, I feel those colours should obviously and naturally be found on our flag. Great article Paul. I think you would find most Australians would agree Wattle Day is a far more suitable and meaningful national day of unity and celebration. There is no better symbol of our land than wattle, far more unique to Australia than the Southern Cross, which already appears on five other national flags.